This past weekend I was at Anglicon for the first time with Books & Chains. It was also my birthday weekend. Sometimes, you just gotta work on your birthday. I did have a good time. Sold lots. Got to meet up with old friends and pet celebrity corgies while they slobbered all over my hands. But now, I'm exhausted. So, here's a Bubble & Squeek for you. Article: I got a shout out in this article: 5 Literary Agents Discuss the Horror Genre. Thank you Lane Heymont. Release: The Jim Baen Memorial Award: The First Decade anthology has been released. This has my story “To Lose the Stars” in it! Review: A nice review of The Jim Baen Memorial Award: The First Decade anthology with a shout out to my story. Jennifer Brozek is a multi-talented, award-winning author, editor, and tie-in writer. She is the author of the Never Let Me Sleep, and The Last Days of Salton Academy, both of which were nominated for the Bram Stoker Award. Her BattleTech tie-in novel, The Nellus Academy Incident, won a Scribe Award. Her editing work has netted her a Hugo Award nomination as well as an Australian Shadows Award for Grants Pass. 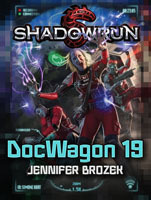 Jennifer’s short form work has appeared in Apex Publications, and in anthologies set in the worlds of Valdemar, Shadowrun, V-Wars, and Predator. Jennifer is also the Creative Director of Apocalypse Ink Productions, and was the managing editor of Evil Girlfriend Media and assistant editor for Apex Book Company. Jennifer has been a freelance author, editor, tie-in writer for over ten years after leaving her high paying tech job, and she’s never been happier. She keeps a tight schedule on her writing and editing projects and somehow manages to find time to volunteer for several professional writing organizations such as SFWA, HWA, and IAMTW. She shares her husband, Jeff, with several cats and often uses him as a sounding board for her story ideas. Visit Jennifer’s worlds at jenniferbrozek.com. "I see story ideas. All the time. They're everywhere. Just walking around like normal ideas. They don't know they're stories."